With the growth of cities, the improvement in urban infrastructures and in general, industrial and human activity, the society is tending to an overproduction and use of energy. The production of energy is generating a worrying increase in greenhouse gas (GHG) emissions. This fact is planted important issues that faces the way of reducing the energy consumption and how to develop more efficient and respectful network architectures with the environment. Research related to how to reduce energy consumption in daily tasks is nowadays one of the topics with the greatest research perspective. It is influencing the design and electronic development, the information and communication technology (ICT) sector, and more specifically, the field of networks. Therefore, the tendency is to develop equipment with better performance and higher availability. This fact implies having powerful devices that in turn will require adequate cooling systems to maintain their functioning. In recent years, the field of research is devoting great efforts in the development of proposals to reduce unnecessary energy expenditure. This is known as greening technologies and network protocols. When we talk about green networking, we must bear in mind that this definition includes all aspects of a network, i.e., personal computers, peripherals, switches, routers, communication media and even, the efficient distribution. Therefore, the new design of Green Communication and networking (GCN) must not only to reduce the emission of greenhouse gases, but must also seek the definition of new and more sustainable development techniques that have zero dependence on fossil fuels and lower operating expenses. Therefore, we must promote the exploitation of renewable energy resources. The energy efficiency of all components in a network must be optimized to have a significant impact on the total energy consumption of these components. Therefore, the natural tendency of new research should explore the new possibilities offered by ICTs and evaluate their benefits in terms of energy efficiency and respect for the environment. Some of the main action and improvement that Green Networking pursues are the proposal of new systems that enhance energy efficiency and reduce energy consumption. To do this, it is intended to design and develop efficient network architectures and the integration of services in a single network considering of the environmental impact of the network components from the design to the end use. The combination of network developments with greater intelligence, autonomy and precision with virtualization techniques can give us a new perspective of design that allows the improvement of networks. Finally, we cannot forget that the key of success in reducing carbon emissions to the atmosphere and the improvement, in general, of the technological environments that surround us are not only a technological issue. A cultural change in the thinking way is required. This Special Issue is focused on the Advances in Green Communications and Networking. It includes twelve selected papers with high quality from the 3rd EAI International Symposium on Green Communications and Networking (GreeNets 2016), which was held in in Valencia (Spain), June 27, 2016. Next we present the papers accepted as October 2015 MONET Special Issue. Traditional networks are characterized by wasting considerable amount of energy that could be reduced drastically by using the Software Defined Networking (SDN) paradigm. 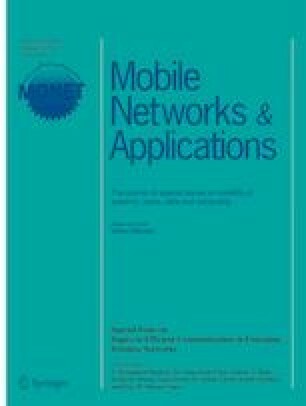 In this sense, the first paper of this SI is “Policy-based management for green mobile networks through Software-Defined Networking” by A. Huerta–Celdrán et al.. This paper presents an energy-aware and policy-based system oriented to the Software Defined Networks (SDNs) paradigm, which allows managing the network infrastructure dynamically at run-time and on demand through policies. According to the obtained results, it is easy to conclude that the use of SDNs permit the reduction to energy consumption when enforcing the proposed policies that considers important aspects in a networks such as the number of base stations and their cell sizes, or the number of active devices in a given time, among other. Following the idea and objectives of SDNs, the second paper “Energy Savings Consumption on Public Wireless Networks by SDN Management”, by J.M. Jimenez et al., presents an interesting study on how to determine the different features and parameters of wireless networks to establish their relationship with the power consumption. To do it, the authors analyze the variation of power consumption of network devices such as access points (APs) as a function of the antenna transmission power. After that, user information from real public wireless network is collected. With this data, authors determine the actual network resources required to stablish a real-time connection. To manage the wireless network resources, the authors proposes a new extension for Openflow protocol over SDN with the goal of keeping the optimal network performance by using the minimum power consumption. The proposal is validated in two different scenarios, a shopping center and a municipal wireless network, with very promising results. Inside a city, we can consider priority road traffic due to the sensitive of the product a vehicle transport. In this sense, it is required to have a network infrastructure that helps us to monitor the road status to stablish the fastest router between two points. In data networks, this task is performed by routers. However, if a real transport network is considered the shortest path can sometimes be affected by incidents and traffic jams that can difficult the reachability of a destination. In this sense, the third paper of this SI “Energy Efficiency in Cooperative Wireless Sensor Networks” by S. Sendra et al. presents a symmetric routing mechanism for cooperative WSN used for fresh products delivery. The systems is based on a set of fixed nodes (the infrastructure) and mobile nodes (the vehicles) that stores the path followed to be able of coming back following the same route in reverse sense. If it is not possible to use this path, the system tries to maintain the symmetry principle searching the route that provides the fastest path, similar to the one used in the initial trip. The paper presents the algorithm used by the systems to calculate the symmetric routes. Finally, the authors tested the system in a real scenario which combines different kind of roads. The results show that the proposed routing mechanism achieves lower power consumption in the whole network. The next paper, “A Method for Power Saving in Dense WiFi Networks”, by D. Marrero et al., proposes an algorithm and a network protocol for energy saving focused on reducing consumption in devices that provide access to the network and are connected to the electric network. The proposal is specifically, focused on the Access Points (AP) operation while most of the current proposals related to WiFi networks are mainly focused on reducing consumption of the user terminals. The results show that using the presented proposal, the consumption in the Aps decreases and the costs is reduced while keeping the utility for which they were designed. As D. Marrero et al. explain in the fifth paper “Energy Saving in Smart City Wireless Backbone Network for Environment Sensors”, a city can be considered as a hostile environment able to support big amounts of people which daily tasks can cause negative effects on Environment. For example, car driving is a typical action that pollutes the city and for this reason more and more government, with the help of research sector, are investing great efforts in developing WSNs for monitoring the levels of pollution and regulation to combat them. These networks collect data from sensors and usually send them to a cloud server for applying big data technology in order to discover behavior patterns of humans. The sensors and the backbone network that send data to that server also consume electric power. Usually the wireless backbone elements are always turned on. This fact incurs a high pattern of electric energy consumption. For this reason, D. Marrero et al. present a novel mechanism for energy saving in smart cities focused on reducing the power consumption of unused Access Points (Aps) in the backbone. As results shows, the presented mechanism allows us to produce a portable wireless backbone network that could be used in several places. Finally, the last paper “Securing and greening Wireless Sensor Networks with beamforming”, by J.F. Valenzuela-Valdés et al., present a new method to optimize the WSN deployment. It is based on the use of beamforming technique with clustering for improving the network lifetime in WSN. Beamforming permits the efficient transmission of the radio signals towards a given (set of) target direction(s). Authors use the beamforming technique in conjunction of clustering for enlarging the availability of nodes in WSNs. To test the proposals, scenarios with different number of nodes and antennae (isotropic and conventional dipoles) are used. The target direction is set up in 2 different angles, i.e., ϕ = 0° and ϕ = 45°. To optimize the number of clusters and the phase and amplitude of the antennas, it is used a genetic algorithm (GA). The results show that beamforming can be used to efficiently and securely transmit the signals between nodes by decreasing the required power radiated in the direction of an unreliable node.